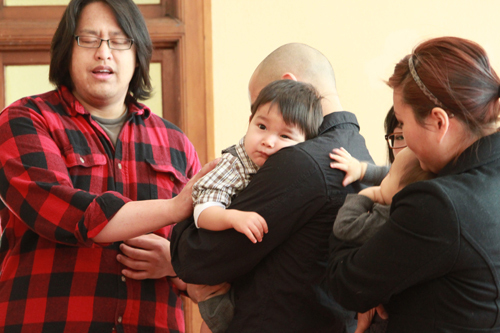 Last month, we held our baby dedication for 4 kids. It was a blessed time. For us as a community, it is incredibly important to incorporate our children into our community–that what we do includes them as well. 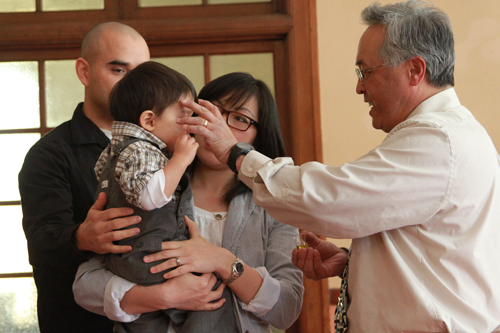 As each child was blessed and anointed by one of our leaders and our own loved ones. 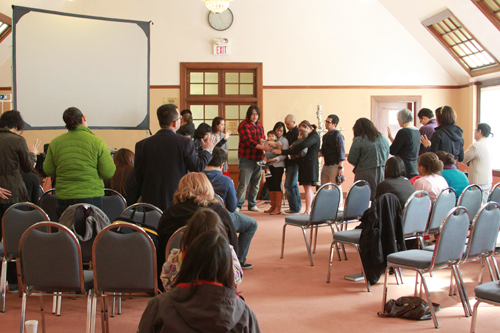 The community and parents made vows to each other to be spiritual leaders and examples for the children and to keep each other accountable as family would. 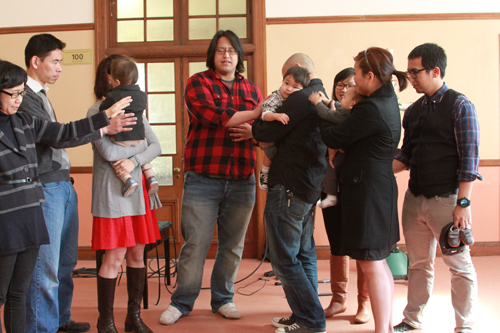 We offered the congregation to make this commitment to the children of Haven. This was also a great opportunity for us to invite our loved ones and friends who don’t typically attend a church and to see what we are doing and why. Why as parents we find it significant to dedicate our child unto the Lord–that these little ones are a blessing from him and every good and perfect gift comes from up above. *We are not Israelites and we are not bound to offering a sacrifice in place of our children because Jesus was sacrificed in place of our firstborn. *We are responsible to raise our firstborns to know the Jesus who died for in their place. *As a community of believers, we have a responsibility. Jesus says: (…whoever receives one such child in My name receives Me; but whoever causes one of these little ones who believe in Me to stumble, it would be better for him to have a heavy millstone hung around his neck, and to be drowned in the depth of the sea. -Matthew 18:5, 6 NASB)… basically, don’t be stumbling blocks. *We can take a higher calling: participate in the raising, praying for, edifying, teaching, disciplining, and loving our the children. The lady of the group, Miss Juliette was not present for this dedication but we had a separate dedication for her on Easter Sunday. Our house communities have been involved in a few Love projects this holiday season. Here’s an update on what we’ve been up to! This past December, we teamed up again with SJSU’s AACF (Asian American Christian Fellowship) to anonymously pass out care packages on the school campus. From past experiences, they were widely well received and people liked that there no strings attached–that we were simply there to show an act of love and kindness without a speech or “recruiting” them to go to church. We also were able to have the other Christian fellowships involved this time around as well. We were encouraged from the students at AACF that took time out of their studying schedule to help us pack 1000 care packages! We hope that this will spark a flame to pass on for others to show unconditional love. Shopping at Costco for the snacks! Every 3rd Sunday, we meet for a all-church worship gathering at Le Petit Trianon Theater in downtown San Jose. Next to do is a housing program called the Victorians. A few of them join us for Sunday worship and sometimes we go over there to hang out. This past Christmas, we celebrated with them with a pizza party because they LOVE their pizza. We also put together hygeine packs for them that consisted of shampoo, socks, toothbrushes and other toiletry necessities. Additionally, one of our church members organized a clothing drive for them so they could go “shopping” and get some clothing. Everyone pitched in and had a great time. 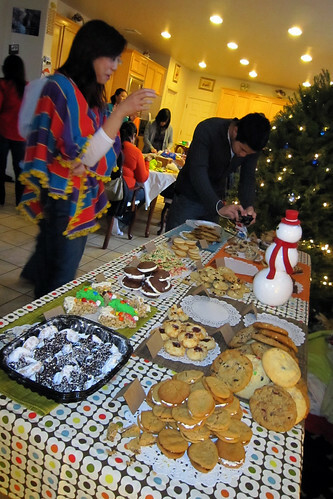 Every year for the past 3 years, a couple in our community hosts a cookie exchange. Not only do we have a fantastic cookie contest but we also bake extras to pack up and donate to Unity Care, a transitional foster care program. We also sewed together some funky sock monkeys for the kids! We hope everyone had a great holiday season in remembering the birth of our Savior. Here is a special Christmas song that Warren recorded! 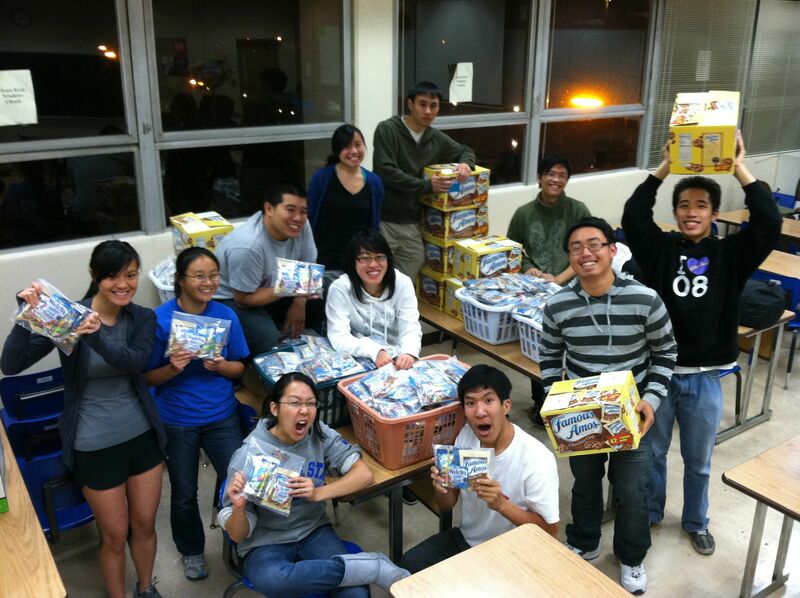 SAN JOSE STATE / AACF CARE PACKAGES PREPPING! @ SAN JOSE STATE 7PM. Some of our house community groups have teamed up with AACF from San Jose State to pass out care packages during finals week. The packages have a few snacks for the students to enjoy! It is a LOVE project and we are trying to maintain anonymity so there should be no identity of who is giving these out except that they are from people to love other people. They will be passing these out the week of December 5! Contact rachel (at) kingsfamily.net for more info! I’m excited to announce that after next LPT Worship service, we’re going have lunch with and pass out hygiene packs to the Victorians who are neighbors next door! We’d like to do a clothing drive too, so let’s start it now, if we don’t get enough it can be ongoing. ALL HAVEN HYGIENE PACKING PARTY :: CARD MAKING :: POTLUCK :: 12/13 @ 7PM Contact missjenniferhuang (at) gmail.com for more info! The Tuesday before LPT, we’ll be packing essential hygiene items for the Victorians. We’ll also write some cards and blessing to them =] Please plan what to bring for the potluck with your house group. Directions to the Brizuelas’. You DO NOT NEED TO BRING the above. Haven will be providing the contents of these hygiene packs. Two Tuesdays from now on the 13th, we will be PACKING them together. This is a great opportunity to invite your friends, especially those who don’t know Jesus! Please bring your old clothes (or new underwear)! Last time friends and co-workers contributed too, so ask yours! We need you to BRING THE ABOVE for this to be a success! One week prior to Thanksgiving, our young home group had our very first holiday meal together. We had an early Thanksgiving pot luck feast, with plenty of food to go around. It was a great time for everybody to catch up with each other. And, since our group has only been meeting for two months at this point, we also used the time to know one another better through sharing and stories. Giving the diverse nature of our group, there were plenty of tales from the recent and not-so-recent past. As mashed potatoes and gravy were passed around, we discussed jobs, school, and family, as well as random and silly topics. Despite the varied nature of the members, each could relate to the others’ struggles, or, at the very least, lend a sympathetic ear. Sooner than anybody expected, the hour grew late, and it was time wipe the cupcake crumbs from our mouths, pack up leftovers, and head off into the night. Even without any games or ice breakers, our Thanksgiving dinner went by quickly, and we all came away with stronger ties of friendship–and maybe a pound or two heavier. While the house community group recognized when opportunities arose to chat about deeper things, they were ready but all in all it was purely intended to be an act of love. “The damp weather as we emerged from the car to unload bags of snacks reminded me how dreadful and unappealing finals could be. It was almost 18 months since my last final at SJSU, but seeing the students scurry around with loaded backpacks brought back, if only just for a second, all the feelings of impending doom. Our small group wanted to bless our community in a way that fit in with the holiday season, and nothing says, “Merry Christmas,” like studying frantically all night for a two-hour test you have no hope of passing. The SJSU campus is about one block away from Le Petit Trianon where our church meets on Sundays, so they were a natural choice. Our group created an ambitious goal to hand out 200 bags full of snacks to students studying in the MLK Library, and soon realized that we needed some help. With a few phone calls and emails, Alan enlisted the services of the SJSU chapter of AACF. Working with AACF turned out to be much more of a blessing than we realized. Most of our small group members are 5+ years removed from college, so the younger folks had a bit of a Antarean effect on us. They had a great time blessing their peers with semi-nutritious goodies found in small brown paper bags. Initially, the reactions from the students studying in the library were mixed. We tried to spread out to all of the floors, and the reception at most floors was luke-warm at best–until the students realized that there really were no strings attached, and the snack packs were truly a gift. Then, we couldn’t give them away fast enough. Clearly, 200 bags were not nearly enough, and we easily could have tripled the number. During the two-hour evening, it only took us 15 minutes to distribute all the treats. Overall, the reactions were genuine gratitude: thankful for some nourishment, thankful for a small break during a potentially long night, and thankful that we didn’t stick around to bore them with a long monologue about why we were there. The reactions from AACF and our small group were also positive, and there might be potential for us to partner up again in the future. After all, it never hurts to encourage other people with a heart to serve. Directions to the Homs‘. Send Al your prayer items or pray with us in person. Dojo is our leadership/discipleship training open to everyone. Come if you have a heart to grow deeper. THURSDAYS @ 7:15pm: BASKETBALL :: MORELAND WEST C.C. Contact Dave for more info. Directions to the Community Center. Bring your best cookie recipe to the NGUYENS on Contact Lisa ASAP to RSVP. Cookies will also be donated to Next Door Solutions. Directions to the Clubhouse (Nguyens’). There will be a series of blog posts on current projects coming soon!